(Inside Science) -- Feral swine, first introduced by some of the earliest European explorers to America, have been roaming Florida for the past 500 years, and are now present in at least 35 states. 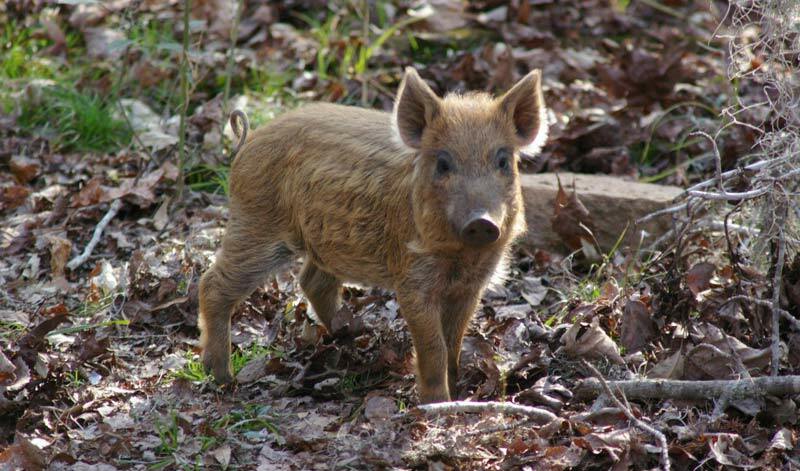 The invasive pigs are well-known as a destructive environmental menace, tearing up sensitive habitats and endangered plants and animals in their search for food. But the hogs can also dig up important archaeological sites, destroying an irreplaceable historical record. "The damage feral pigs do to everything else -- crops, wetlands, endangered species -- it can all grow back," said Richard Engeman, a biologist with the U.S. Department of Agriculture. "But once you move artifacts around, that doesn't grow back." When rooting for food, the pigs regularly dig several inches or more below the surface, potentially moving or destroying artifacts. The trails they make also speed up erosion. Engeman and his colleagues have inspected more than 300 archaeological sites at two Air Force bases in Florida -- Avon Park Air Force Range, near the middle of the state, and Eglin Air Force Base in the Florida Panhandle. The researchers found that 42 percent of the sites on each base showed signs of disturbance by feral swine. On Eglin, Engeman found that as much as 26 percent of the surface area of some sites had been dug up by pigs. And he believes that to be an underestimate of the true damage. "In Florida, there is a lot of sand and fine soils, and a lot of rain, so everything gets grown over quickly," he said, meaning the signs of pig disturbance can disappear within a year or two. "The actual disturbance over the centuries is likely a lot more." Kathy Couturier, a Department of Defense contractor who looks after the cultural sites at Avon Park, said the feral swine are causing significant damage to many sites that are eligible to be included on the National Register of Historic Places. "Each year we see more and more damage," she said. The base is home to a mixture of historic sites such as the early 19th century Seminole War era forts Kissimmee and Arbuckle, and older prehistoric sites, including one called the Orange Hammock Complex that is the most important pre-Columbian archaeological site on the base but has so far not been well-studied. Archaeology relies on carefully cataloguing the different depths at which artifacts are found to create a historical timeline and picture of daily life in past centuries, a process called stratigraphy. But the hogs make that impossible. "I've seen them root up historic trash middens, arrowheads and seashells," said Couturier. "You can't get that stratigraphy back." Engeman has seen evidence of pigs digging up and damaging delicate artifacts like glass bottles, and even heavier items like bricks. And at some of the sites, like the Seminole War era forts, there are not many artifacts there in the first place, since the forts were only occupied for about eight years, said Couturier. "So any little crumb you can get is significant," she said. Worse, many of the sites, including Orange Hammock, contain human remains, which the pigs will dig up or even eat. That's a loss not just for archaeology, but even more so for the Native American tribes whose ancestors are buried there. "The destruction can have major cultural effects," said Engeman. The Air Force is doing what it can to protect vulnerable sites from the feral swine, said Couturier. They have built a hog-proof fence around Orange Hammock and another along the base's northern border, to separate it from a hunting ranch where pigs are a regular quarry. "We don't want [hunters] chasing them down onto our property," she said. But fences aren't a practical solution for much of the base. "We can't just willy-nilly put these fences around areas," said Couturier. Besides their expense -- the one around Orange Hammock cost $18,000 -- they need to be constantly maintained, which is time-consuming in an area with soft sandy soils and frequent hurricanes. And the barriers get in the way of the base's regular ecological maintenance. One-third of the base is subjected to a controlled burn each year -- a vital activity to maintain the ecosystem -- and some of the fences would need to be replaced after those burns. Avon Park also encourages hunting of the pigs, but there is evidence that the more you kill, the bigger the litters of the survivors are. "It seems to be a futile endeavor," said Couturier. The option to excavate as many of the sites as possible before they are irrevocably lost is not generally a consideration, because the resources and technology to do that aren't available, said Engeman. "A lot of archaeological protection involves leaving it in the ground until there is the time, money and technology to properly investigate it," he said. Unfortunately, the hogs may be making that impossible.